All you need to do is simply place your phone book in your green recycling cart! Tired Of Getting All Those Phone books? 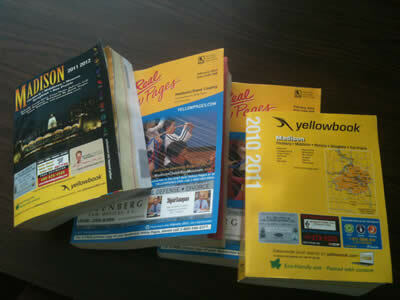 In Madison you can receive as many as six different phone books every year. Did you know that you can stop those phone books with a simple click of your mouse? Well you can. All you have to do is visit this web site and follow the instructions. To stop the flood of junk mail see the Junk Mail link in the column of the right.